TOKYO, Japan (CNN) -- U.S. Secretary of State Hillary Clinton arrived in Japan Monday to begin a week-long trip through four Asian nations, looking to begin building new international relationships to help tackle some of the world's toughest challenges. U.S. Secretary of State Hillary Clinton at Haneda International Airport, Tokyo, Japan, Monday. Speaking to reporters en route to Tokyo, Clinton said "going to Asia is, for me, a very big part of how we're going to demonstrate the Obama administration's approach to dealing with the multitude of problems that we see, but also the opportunities as well." Her visits to Japan, Indonesia, South Korea, and China will include discussions on a host of sensitive topics, from climate change to nuclear proliferation. And Clinton vowed that she will not be "shying away from talking about human rights issues." But there will likely be few fireworks or confrontations. "I think it's fair to say that this first trip will be one intended to really find a path forward, to have as robust an engagement as possible on a range of issues," she said. 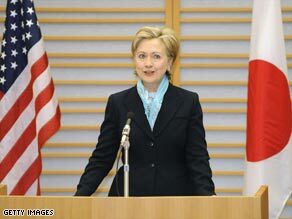 Clinton added: "I chose to go to Asia deliberately in order to send that message that we are reaching out. We do see Asia as part of America's future." Her meetings will not be limited to government officials, Clinton said, "because I think it's important that we get out of the ministerial buildings and listen to the people in the countries where I'll be visiting. So to that end, I'll be doing town halls and visits in areas of concern that we can discuss with NGO leaders and local officials." The backdrop for the visit is the global economic crisis, she said. All four nations are members of the G-20, which is composed of financial leaders of 19 nations and the European Union. The group was formed in the late 1990s to bring together key figures to help improve the world economy. The next G-20 meeting is in London in April. "I will be discussing with them the approaches that each are taking, explaining what we have just done with the passage of our stimulus bill, and seeking greater cooperation about how together we're going to work our way through these very difficult economic times," Clinton said.